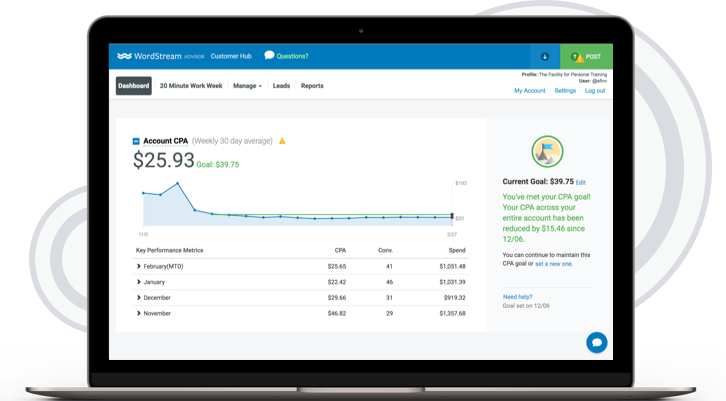 WordStream Advisor is the only software designed specifically to help small- and medium-sized businesses maximize results from their online advertising. What would your business look like if you converted 30% more leads from your online advertising programs? 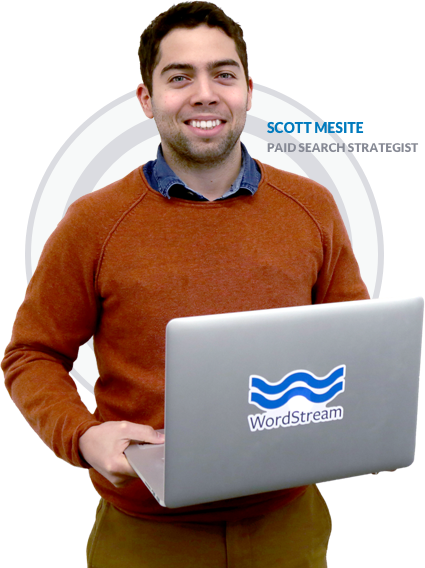 WordStream Advisor helps businesses using Google Ads, Bing, and Facebook turn clicks into paying customers. WordStream allows us to bring all our PPC together under one platform. I like that we can manage both Google Ads and Facebook within the platform. The 20-minute work week provides suggestions for new keywords and negatives to optimize each campaign. Normally, this would take much longer than 20 minutes so we're happy that WordStream has taken so much of the heavy lifting off our shoulders. The 20-Minute Work Week makes time-consuming optimizations easy, with recommendations that actually impact business growth. Customized, cross-platform alerts streamline high-priority actions across devices and networks, saving you hours every week. Advisor gives you the tools to easily build and manage campaigns across platforms - without ever opening another tab! By streamlining your Google Ads, Bing, and Facebook ad accounts, you can easily replicate success across ads, campaigns, or even entire networks. This product saves me hours a week in terms of all my ads maintenance (Google Ads, Facebook, and Bing). But above and beyond that, the WordStream team gets 10/10 for customer success. I've never felt that a company was so invested in the success of my company and also my own personal growth as an account manager. - Rachel Gould, Clearpath Inc.
You’ve built and optimized, but is it working? 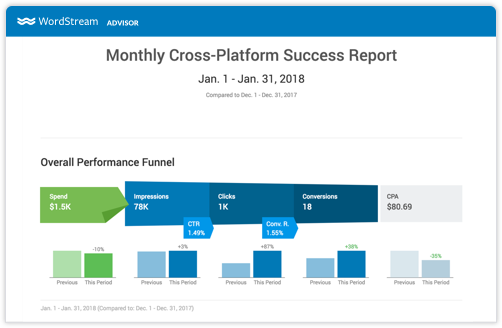 Advisor’s Performance Dashboard shows you key metrics from all of your accounts, highlighting the campaigns headed in the right direction and the ones that require attention. Need to drill deeper into your data? Success Reports offer a clear, digestible way to uncover new insights and share performance with key stakeholders from across your organization. Professional-quality creative can be one of the biggest obstacles to getting started with Facebook Ads or the Google Display Network. By combining machine-learning with your website and business page, Advisor’s Smart Ads suite automatically turns your existing images into agency-caliber ad creative (without charging you another cent). From training to support, thought leadership to product innovation, our customers love us. Advisor’s Easy Tracking makes measuring success simple, allowing you to capture leads, calls, and sales from Google Ads, Facebook, and Bing with a single piece of code. Simply place the WordStream Tag on your website, tell us which on-site actions are valuable to your business, and your days of manually adding and updating snippets of code are over. You’ve got more to do than online advertising, and we just happen to have a team of experts! Whether they’re developing cross-platform strategies or conducting competitor research, writing clickable ad copy or simply sharing tips with you, our consultants will help you maximize every dollar you spend without the added cost of hiring an in-house expert. 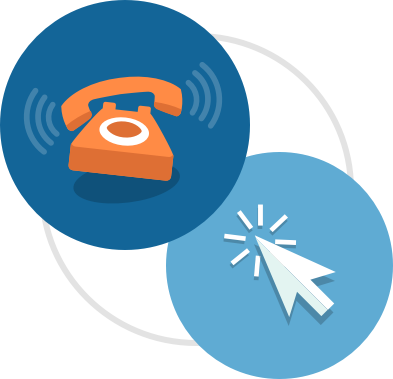 With WordStream Advisor at your disposal, business growth is just a click away. See how our tools and team of experts can help you streamline your Google Ads, Facebook, and Bing Ads accounts: start your free trial today!